In 2006, the family computer on which our digital photographs were stored had a hard drive failure. Because I'm obsessed with backups, it shouldn't have been a big deal, except that my backups had been silently failing for months. Although I certainly learned a lesson about verifying my backups, I also realized it would be nice to have an off-site storage location for our photos. Move forward to 2010, and I realized storing our photos in the "cloud" would mean they were always safe and always accessible. Unfortunately, it also meant my family memories were stored by someone else, and I had to pay for the privilege of on-line access. Thankfully, there's an open-source project designed to fill my family's need, and it's a mature project that just celebrated its 10th anniversary! Piwigo, formerly called PhpWebGallery, is a Web-based program designed to upload, organize and archive photos. It supports tagging, categories, thumbnails and pretty much every other on-line sorting tool you can imagine. Piwigo has been around long enough that there even are third-party applications that support it out of the box. Want mobile support? The Web site has a mobile theme built in. Want a native app for your phone? iOS and Android apps are available. In fact, with its numerous extensions and third-party applications, Piwigo rivals sites like Flickr and Picasaweb when it comes to flexibility. Plus, because it's open source, you control all your data. Piwigo supports direct upload of multiple files, but it also supports third-party upload utilities (screenshot courtesy of http://www.piwigo.org). 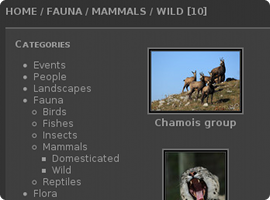 Categories, tags, albums and more are available to organize your photos (screenshot courtesy of http://www.piwigo.org). If you haven't considered Piwigo, you owe it to yourself to try. It's simple to install, and if you have a recent version of Linux, your distribution might have it by default in its repositories. Thanks to its flexibility, maturity and downright awesomeness, Piwigo gets this month's Editors' Choice award. Check it out today at http://www.piwigo.org.